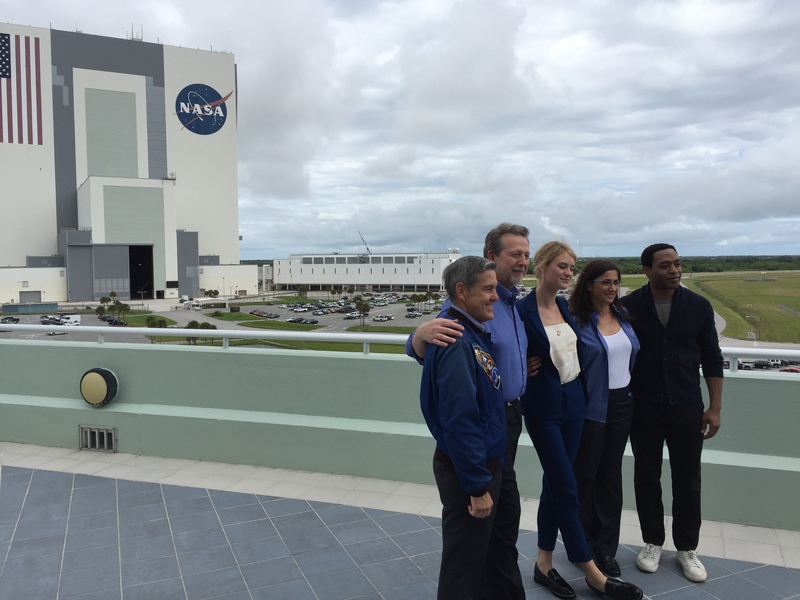 From left, former shuttle commander Bob Cabana, director of NASA’s Kennedy Space Center; Jim Green, director of NASA’s Planetary Science Division; Mackenzie Davis, who plays Mindy Park in “The Martian”; former astronaut Nicole Stott and Chiwetel Ejiofor, who plays Vincent Kapoor in “The Martian” pose for photos at Kennedy near the Vehicle Assembly Building on Thursday. Cast members from the film “The Martian” met with real NASA scientists, engineers and astronauts Thursday to discuss NASA’s Journey to Mars with students during a Digital Learning Network at NASA’s Kennedy Space Center in Florida, launch site of America’s missions to send astronauts to the Red Planet in the 2030s. 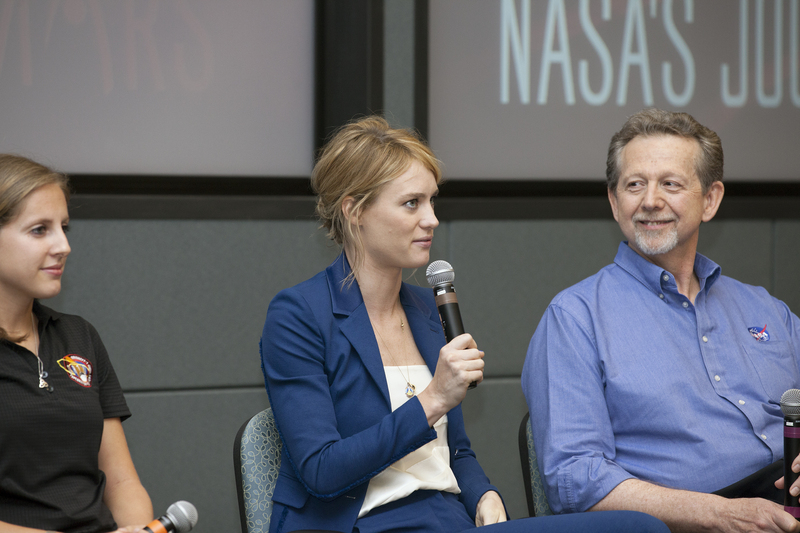 Actors Chiwetel Ejiofor and Mackenzie Davis took the stage during panel discussions with middle and high school students in the room and from across the nation via the Web. 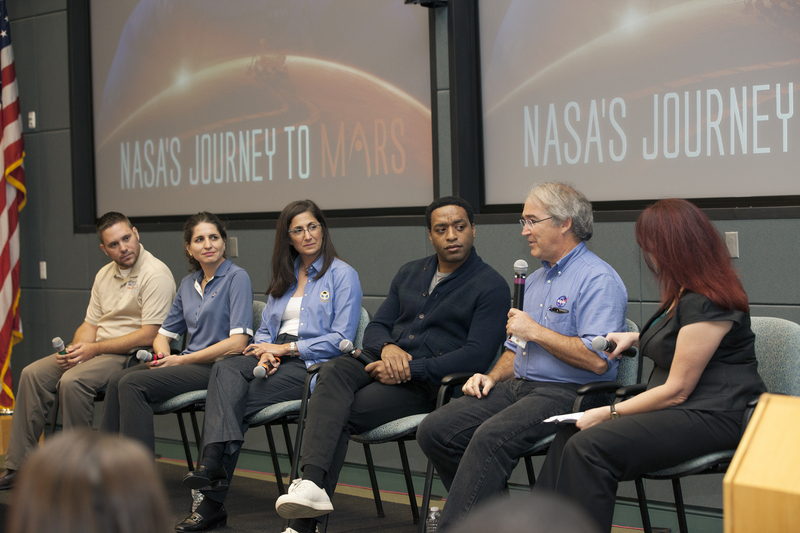 The students heard from NASA’s Jim Green about the changes that took place on Mars that make it the surface we see today while other engineers and scientists detailed steps already underway to develop technologies astronauts will need to make the mission a success. Afterward, the group toured Kennedy’s launch pads and other facilities.